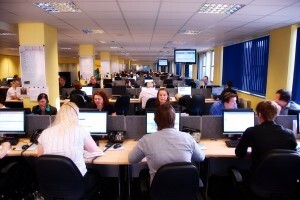 Sales and marketing business Clearanswer is to bring more than 300 jobs to Yorkshire. The 15-year-old company, which provides call-centre solutions, will create 300 new jobs at its Hull office with more set to be announced at its Leeds office. Clearanswer already employs almost 700 people in Hull - the extra 300 will be in place by early next year - and 60 in Leeds. There is space for an additional 40 staff in the Leeds office. Senior recruitment and facilities manager Sue Thompson said: "You read about redundancies all the time but this is really good news. "It's not only good for the company, it's good for Hull. It's the people of Hull who have made this a success, the people we employ." All the new jobs are to be full-time and permanent. Clearanswer was originally set up by Phil Marston, a former sales manager at Telewest.